Portadown goalkeeper David Miskelly (fourth right) with County Antrim players following the landmark Milk Cup win. Also included are his former Portadown team-mates Andy Hunter (fourth left) and Matthew Tipton (right). Pic by PressEye Ltd.
At first glance, few parallels appear to exist between the Milk Cup and an Irish League season. However, David Miskelly is happy to draw comparisons in the hope that lessons from County Antrim’s grassroots glory can help him pick up a medal with the Ports. The Portadown goalkeeper started his season with a prize thanks to last week’s landmark victory for the Premier boys - a first county triumph at that standard in Milk Cup history. Now he wants to end his season with similar celebrations by adopting many of the key ingredients that helped County Antrim achieve such a memorable triumph. Miskelly considers the themes of togetherness, a collective desire to win and mental focus that gives ability the chance to shine as not only the foundations of the County Antrim success but key to any Portadown progress. 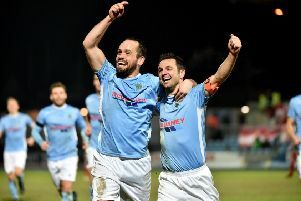 “People actually give us a bit of stick for setting up County Antrim to win as the Milk Cup is a developmental tournament,” said Miskelly, who was part of a County Antrim backroom team that also included former Portadown team-mates Matthew Tipton and Andy Hunter. “But it is also important to develop the mental aspect of a player so he is ready to step up into a first-team squad and handle that responsibility. “If you do not have that winning mentality at that level it is going to be very difficult for any player, no matter how much technical ability is involved. “That is why I feel so many players struggle when they come back home and join an Irish League club after spending time as young lads across the water. “You need a certain kind of mental discipline and attitude towards games, that every match is important and you can accept the challenge. “Mental strength is crucial and, to be honest, we did not coach the County Antrim players in as much as we set them up with a winning mentality and gave them the confidence to go out and perform. “It was quite emotional after we won and during the presentations and you could see how much it meant to the boys. “Even when I look at County Armagh’s achievement in holding Right To Dream to a scoreless draw. Miskelly is keen to help inject those attributes into the Ports panel. “It is about sticking together and approaching every single game with that focus leading up to the match and right mental preparation, then working as one on the pitch,” said Miskelly. “The attitude should be three points every single match as we have good players but must always show the heart and desire to go along with the talent. “Obviously there is a difference between selecting a squad and preparing for one week of intensive football compared to a club environment in which everyone is in it together week in, week out. “However, there are fundamental aspects to get right. “For example, the issue of our poor disciplinary record last season has been discussed and will improve overall.